A modern bathroom should evoke feelings of relaxation and rejuvenation, a place where you can unwind and take a minute for yourself. As such, your bathroom style should reflects this. For some, a modern bathroom design can evoke white, minimalist and clean designs. For others, it’s about getting back to nature with natural stones or living walls. The rise of the smart home has introduced some truly exciting technology to home designs. Most people may have heard of voice-controlled lights or blinds, but everything from self-cleaning, seat-warming toilets to full waterproof entertainment systems can be set up with a little forethought and investment. The statement basin is a unique spin on making your simple utilities into a centrepiece of the space. A statement basin can include minimal aesthetic additions to a vanity or complex, carved patterns adorning it. If you’re really keen to emphasise the luxuriousness of your personal getaway, adopting a day-spa look could be just what you need. The centerpiece of a resort style bathroom design is the bathtub, everything should revolve around the bathtub. From there, decorating with neutral, soothing colours and textured materials will allow you to capture the feeling of a weekend getaway every single day. When applied to a bathroom, a metallic touch can serve as both contrast and accompaniment to the atmosphere of a room. Contemporary designs employ metallic finishes to contrast with a neutral backdrop . 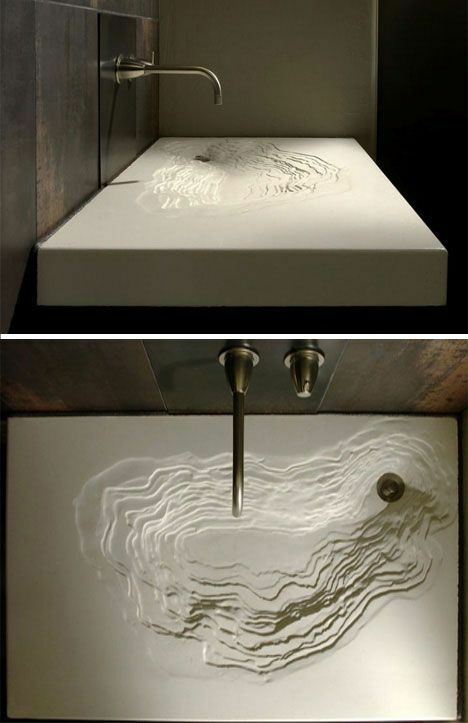 They act to draw the eye towards a feature or area of the house you want to be the focus point. Keep in mind that there are practicalities (and sometimes drawbacks) to your choice of metal. Brushed nickel is one of the more durable, low upkeep choices available, however it is not as striking as other metals. Chrome on the other hand is extremely versatile and looks amazing but it is easily scratched and requires constant cleaning from fingerprints. Even among those who like to get back to nature, there is differences of opinion on how best to achieve that look. If you find yourself more at home with the image of a country homestead over a cabin deep in the bush, you might want to consider a design that evokes the rich, wooden aesthetic of a country villa or townhouse. For a lot of people – particularly urbanites – a weekend retreat out to the bush can be just as relaxing as a day of pampering. The chief consideration is, of course, to decorate in the way that most appeals to you and fits your idea of the perfect escape. The one material room needs to be handled with expertise and care. They are tricky to pull off and hard to compromise with (after all, it’s easy to see even the slightest mismatch or inconsistency), but when that perfect balance is achieved the results can be absolutely stunning. One comparatively simple way some people manage to pull off the look is through the zen ‘white-everything’ approach. This will also make any colour or aesthetic contrast pop amazingly well. Just be sure if you’re thinking of this design approach that you are able to handle the uniform nature not needed. The look certainly is not for everyone, and can be somewhat overstimulating for a few people. Definitely one to research first. Much like statement basins, freestanding bathtubs take a central utility of the room and transform it into the design focal point. The most popular style of freestanding bath that you will see is the minimalist, angular block-style. Usually stark white and contrasted against a black-and-white or other high contrast setup. 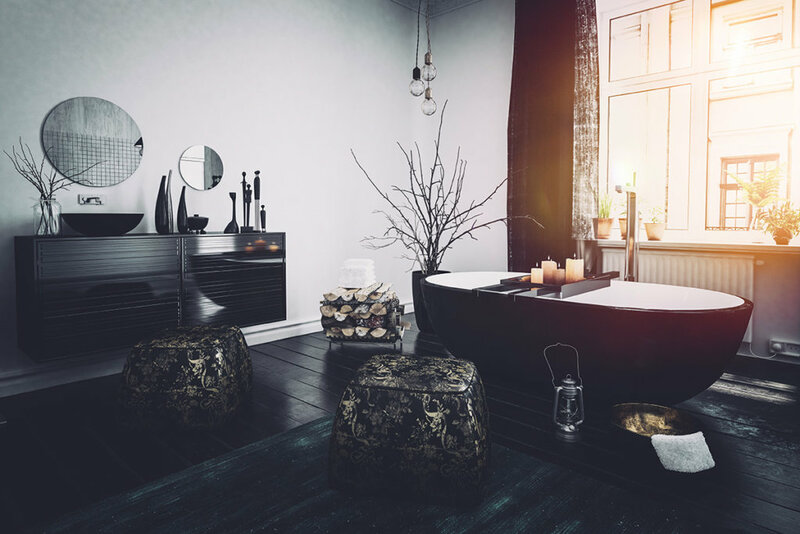 However, there are many, many ways to make a tub stand out, from from its shape to its positioning, it’s not uncommon to see a statement bathtub take central position on the floor of a larger room. On top of the aesthetic choices for your basin, a prevalent theme among recent bathroom decoration trends is to create space beneath the vanity to give the illusion that the vanity is floating away from the floor. Adding space by ‘floating’ cabinets is a common trick used with bathroom design to make a space appear bigger, but also can be installed for comfortable height and highlight your floor and wall. The modern Australian bathroom is positioned between simplicity and elegance, but ultimately the design choices in your bathroom should evoke your personal aesthetic. Everybody deserves a space in their home to unwind and relax, so use our house customisation guide create a bathroom space that is truly yours.